I spent a month living in New York this year, house-sitting for a friend in Brooklyn. There’s something exceptionally nice about borrowing a friend and fellow-writer’s entire book collection. I read my way through a lot of Meghan’s books during my ad-hoc New York residency: in addition to having Brooklyn’s handsomest and most hilarious kitten, Meghan has a fantastic book selection. Ben Lerner’s Leaving the Atocha Station is rich with insight, an ambling and sharp examination of language and culture and the construction of self. The novel follows Adam, an American poet living in Madrid on a writing fellowship, as he navigates the dislocations of living in another language. This concise novel roams through Adam’s experience abroad, following him to parties and museums and Retiro Park hashish dealers, and through two romantic relationships. It is obliquely comedic and at once densely intellectual and compelling. For me, Leaving the Atocha Station reaches its height in its exploration of language. Adam often self-consciously exploits the gaps in his Spanish fluency to create a particular projection of self. Wandering with his Spanish girlfriend through a museum, for example, he trails off at the end of sentences as though his ideas exceed his Spanish vocabulary — so as to suggest that he has depth and insight that only his linguistic limits veil. For Adam, comprehension and incomprehension become tools that allow him to mediate himself and craft a self-translation. The novel sounds dense and esoteric, but it is vivid and comedic and brief. A surprisingly engaging read that had me pausing to marvel over sentences of startling and recognizable insight. I started reading Cheryl Strayed’s essays when I was in graduate school, and at various times read her Dear Sugar column. But it was newly impactful to read the columns collected into a book. Strayed is candid in a way that defies the advice column genre and insightful in a way that transcends the ways we normally talk about life with its myriad hardships and windows for growth. She writes openly about her own family, her life as a writer, her second marriage, her divorce. Tiny Beautiful Things becomes a second memoir, except in a radical new form. A memoir that is relational and interactive and directed outward. Strayed uses her columns to provoke and console and stand with her letter-writers in the precarious, disquieting spaces of life. Strayed offers a distinct perspective, delivered in a frank and uniquely intimate way. Celeste Ng’s novel Everything I Never Told You tells the story of a family in the 1970s after the drowning death of its teenage daughter. But Lydia Lee’s inexplicable death is inextricably linked to the family’s larger story: its history, its myriad secrets and private disappointments. Weaving through time, Ng explores the experiences of Lydia’s parents, Marilyn Lee, who had aspired to be a doctor before conceiving her children, and James Lee, a professor of Chinese-American heritage. The Lees live in the intersections of personal experience, racial prejudice, and gender expectations — and each of these plays out to devastating consequence in the life of their daughter. Reading Ng’s novel is pure pleasure. Engaging and suspenseful, I read it in the course of one day during my New York residency, carrying it around with me through the Botanical Garden and finishing it in Prospect Park just as the sun set. But it’s one of those books that sticks in your bones, manifesting slowly in the months afterward. And in part that is because I realize how alive anti-Chinese-American prejudice can be — how actively it is at play in our contemporary institutions and culture. And partly this novel stays with you because of Ng’s capacious emotional depth and generosity. Her characters, in all their tragic flaws and shortcomings, cannot escape grief, but they are never beyond grace and redemption. 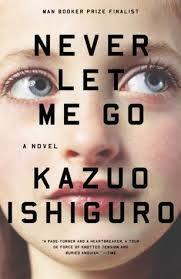 I don’t want to say too much about Kazuo Ishiguro’s speculative novel Never Let Me Go because part of the delight and reward of reading it is discovering as you read what you’re reading about. But I will say this: Ishiguro draws you into an enveloping world through the eyes of his narrator, who goes back over her childhood memories of being away at school — memories that feel at once strange and lullingly familiar. Ishiguro’s narrator is searching and observant, noting with great insight the dynamics at play among friends as they grow older, and noting with remembered puzzlement the dislocations that comprise her life’s central mystery and meaning. Ishiguro is master of the details — a cassette tape found in a seaside secondhand shop, for instance — that shade a life, and ultimately of the subtleties that make us human. * The first installment of the best books I read this year is here. And see more of my New York residency here, including New York writing, the Brooklyn Botanic Garden, and the new Whitney.